This Micro ring hair extensions is Hera's 20 inches curly texture #1B color Indian remy micro ring hair extensions(Indian remy micro bead hair extensions). 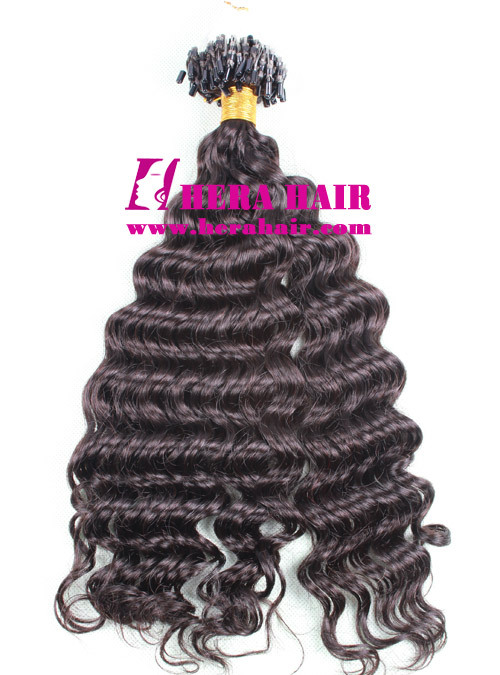 Hera is the best professional Indian remy micro ring hair extensions supplier and wholesaler in Qingdao, China. Hera's regular micro ring hair extensions is 0.9g/strand, 100strands/pack and we can do other weight micro ring hair extensions, such as 0.5g/strand, 0.75g/strand etc. according to your special requirement. Hera's Indian hair materials mainly can do dark color (#1,#1B, #2, #3, #4) and medium color (#6,#8,#9,#10,#30,#33), which we can base this color to do piano color and ombre color style. If you want light color micro ring hair extensions, you have to buy virgin hair micro ring hair extensions, such as Brazilian virgin micro ring hair extensions, Indian virgin micro ring hair extensions, Malaysian virgin micro ring hair extensions, European virgin micro ring hair extensions etc. We welcome hair salon owners, hair wholesaler wholesale Indian remy micro ring hair extensions from us, which our Indian remy micro ring hair extensions wholesale MOQ is 10packs/same hair and length. Hera can adjust the micro ring hair extensions production according to your market special requirement. Personal buyer for Indian remy micro ring hair extensions, you can go to our online store to place order directly with Paypal, which is free shipping to worldwide. About micro ring hair extensions, we have not stock, so we have to produce the hair extensions according to your order details, which production will take about 10-12 days.